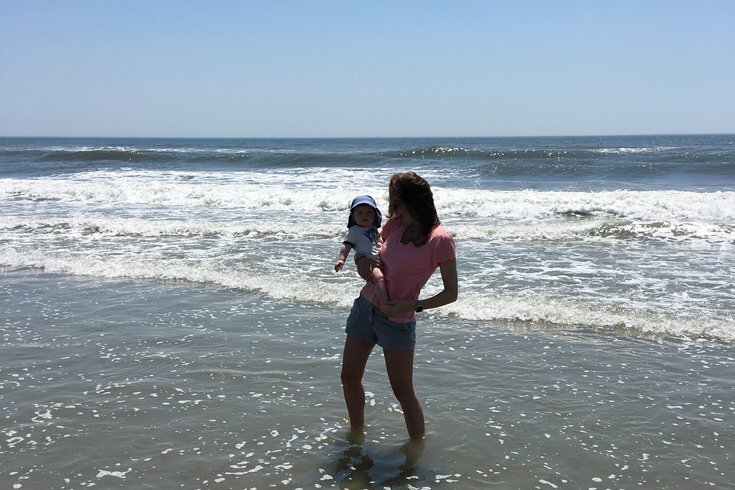 Katie's baby got his feet wet in the Atlantic Ocean for the first time last week. Killian's Mama is so excited to splash and play in the pool and sea with her baby boy this summer! The unofficial start of summer is upon us! As a Jersey Girl who loves being down the shore, I count down the days until Memorial Day weekend all winter long. As the end of May grows near, I become giddy with excitement. There is nothing I enjoy more than hanging out on the beach, spending time with family and friends, soaking up the sun and splashing in the sea. This summer is going to be the best yet because I will be sharing it with my precious son. Killian has already gotten his feet wet in our pool and the Atlantic Ocean, and he seems to absolutely love both. My little water baby is going to be swimming a lot this summer and hanging out on the beach and poolside, so it is important for me to be prepared to keep him safe while he enjoys the season. Here are some of the things I am doing and using as we embark on aquatic family fun this summer. My son's safety and well-being are paramount to having a good time. It is important for us to stay on his feeding and nap routine, to protect his delicate skin from the intense sun and to ensure he is hydrated in the heat and has the right gear to keep him safe and enhance our fun. I am stocked up with sunscreen, swim diapers, bathing suits and baby rash guards. Even though my family always brings umbrellas to the beach, I purchased a pop-up beach umbrella tent that will be dedicated to Killian. Based on our first experience a couple of weeks ago, my baby boy is going to want to be down at the water’s edge more than in the shade, so it’s a good thing that we have a great hat that he loves wearing. I have learned that protecting Killian’s eyes are just as important as protecting his skin, so we also have sunglasses for our baby boy. The whole point of going to the beach is to have fun, so of course I had to get some sand toys for him to enjoy (and probably chew on!). My plan is to take Killian down to the beach in the morning before his 10 a.m. nap or later in the day after he wakes up from his afternoon nap. As the summer advances, the midday sun and heat will be really intense, and I think it is probably best to keep him off the beach during those hours. Once the ocean temperature warms, I will take him in the water for his first dip just like my parents did with me when I was a baby. As excited as I am to share my shore days with my baby boy, I also know that there is a level of caution that needs to be exercised. Accidents can happen anywhere, and there are a lot of things to be aware of for a young baby on the beach. I will be keeping a close eye on my son to ensure he stays safe while having fun. Since we have enjoyed some nice, warm weather recently and our in-ground pool water is heated to 80 degrees, we have already enjoyed some family swim time with Killian. Before he gets into the water, we liberally apply baby sunscreen (everywhere but his hands) to ensure Killian’s sensitive skin is protected. We put him in a swim diaper to prevent any unfortunate accidents in the pool, and we use the same hat and sunglasses that we use down the shore. We start by splashing on the steps so Killian gets his feet wet and can show us whether or not he is enjoying the water. He usually indicates that he wants more, so my husband will hold him in the shallow end or we put him in a baby float. Killian is never unsupervised or unattended, but I am especially eagle-eyed when we are in the pool. Either my husband or I always have our hands on our son, and we are careful that he does not get water in his mouth or ears. We are taking family swim lessons this summer so Killian will be taught how to float and my husband and I will be shown the best way to care for our son when in and around our pool. Tragic drowning accidents are common with young children, so we are taking every precaution in and around our pool. While Memorial Day weekend is regarded as the start of summer in the Greater Philadelphia region, this holiday was not created to mark the start of beach and pool season. Killian is too young to understand that Memorial Day honors the men and women who have served our country and given the ultimate sacrifice, but as he gets older, it is something that my husband and I will teach him. The members of the United States military who gave their lives for our freedom deserve the recognition and admiration of a grateful nation. This holiday weekend, while I am enjoying time with my family, I will thank those currently serving and those no longer with us. I hope you will, too. I will keep you posted on how we do at the pool and beach this summer! While I think we have it all figured out, as a new parent, I have learned that flexibility and adaptability are key. I know that as long as I am putting my son’s safety first and fun a close second, we are going to have a wonderful summer together. Any tips for enjoying the pool and beach with a baby? Share with me and other parents in the comments section below or tweet me @ThePhillyVoice and @KathleenEGagnon.